For whooping cranes and other species, life depends on the health of Texas bays. Two distant white blobs stand out against the grayish horizon on an overcast day as the 75-foot Wharf Cat chugs slowly across Aransas Bay on its way to the Aransas National Wildlife Refuge. Bracing myself on the boat’s observation deck, I focus my binoculars on the marshy southwest edge of the refuge and then nearly drop them in excitement as the blobs resolve themselves into a pair of huge birds feeding in a shallow pond. One of the birds lifts its head in our direction, and there is no mistaking the distinctive reddish-capped head, the prominent beak, the long, curving neck, the stilty blue-black legs. 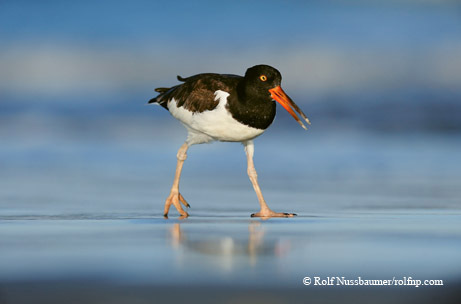 Listen to a podcast of "Bird by Bird, Fin by Fin, Drop by Drop." There’s a collective gasp from my fellow passengers, who have come to Port Aransas on this cool, breezy late-February weekend for the Whooping Crane Festival. Because the endangered cranes have had such a precarious hold on the earth over the past decades, this is like getting a glimpse of a fabled relic from a mythical age. It feels as though we have spied a unicorn in the mist. “That’s old Lobstick,” says George Archibald, founder of the International Crane Foundation, whose voice crackles with emotion over the boat’s loudspeaker. He has spotted an old friend. Named for his nesting area in Canada — in wetlands along Lobstick Creek, in the Northwest Territories — the 32-year-old patriarch is the oldest-known bird in the flock, says Archibald. Along with his younger mate, the elderly crane has staked out this part of the refuge, and he is usually the first whooper that visitors to the refuge can spot from the water. Sadly, he and his mate had no chick accompanying them this past fall when they arrived at the refuge after their long migration from Canada. The number of surviving whooping cranes has been encouraging this past winter, however, according to Tom Stehn, who directs the crane program for the Aransas reserve. The total count for the cranes as of mid-February, he says, was a record 281, which suggests a rebound from the disastrous winter of 2008, when the flock saw a significant die-off. It appeared that many of the birds had starved to death. Because Texas bays are inextricably connected to inland watersheds, the cranes, like all the creatures that draw sustenance from the bay ecosystem, are affected by what happens upriver. Freshwater inflows from rivers provide the renewal water that flows through the estuary, diluting seawater and delivering nutrients. The winter of 2008 was marked by the severe drought that affected Texas rivers and therefore the bays into which they empty. 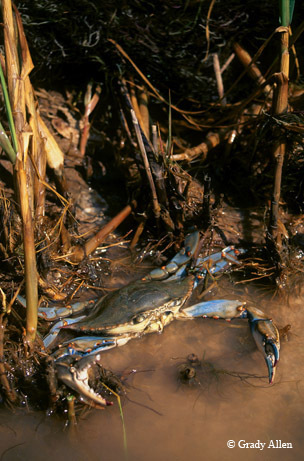 As freshwater flows from the Guadalupe River into San Antonio Bay decreased, salinity in San Antonio and Aransas bays increased, and the blue crabs, on which the cranes depend, declined in size and numbers. Inflows, then, are a key factor in survival for life in and around the bays. “We have to maintain habitat quality through environmental flow management in the watersheds,” emphasized Liz Smith, a researcher at the Center for Coastal Studies at Texas A&M–Corpus Christi, who has begun working for the International Crane Foundation. The species may appear to be slowly recovering, Stehn notes, “but to me they are walking toward the cliff and in danger of falling off.” The fate of the cranes is entwined with the state of the bays that surround their winter habitat. “The bays must remain highly productive,” he says. There is plenty of potentially bad news to consider about Texas bays and the complex, interconnected chain of life that they sustain. Texas is not only subject to recurrent drought and floods, which affect the freshwater flows into its seven major bay systems, but the Texas Gulf Coast is largely flat and therefore vulnerable to subsidence, erosion, tropical storms and hurricanes. Large swaths of the coast and the inland watershed systems that affect the flow of Texas rivers and thus the bays are being rapidly developed. Wetlands are diminishing, and the demand for fresh water is increasing quickly. The good news is that Texas bays have been blessed, geographically. They are protected to an extent by a unique array of barrier islands, though development is proceeding apace on many of those sandy front lines. What’s more, the bays have proved surprisingly resilient, at least so far. By some measures, the bay systems, and particularly Aransas Bay, are in relatively good health, given the human pressures and climatic extremes that they are subject to. Water quality has remained fairly stable, and some fish populations are actually rebounding. Perhaps the best news for Texas bays is all the measuring and monitoring going on, from counting such creatures as cranes and seatrout and shrimp to the almost constant probing of such water-quality variables as salinity, turbidity and dissolved oxygen capacity. As I journeyed around Aransas Bay, meeting with folks whose business or whose passion it is to assess how our bays are doing, I felt a sense of confidence that we won’t be caught unaware should the delicate balance at work in the bays begin to tip. The big picture of the bays actually begins with some of the smallest of the life forms that ply their waters. Karen Meador, who works as Aransas Bay ecosystem leader at the Rockport station of Texas Parks and Wildlife Department’s Coastal Fisheries Division, describes the importance of the bag seine technique she and her colleagues use to collect samples of the assorted small fry that have spawned on the edge of the bay. The samples are particularly crucial each spring, she says, because they are an indicator of how the reproductive phase of several species fared during the winter. We walk out to the edge of Little Bay, buffered from Aransas Bay by the sandy sliver of Rockport Beach Park. Meador points out the noisy black skimmers and American oystercatchers that are nesting in a protected area of the park. Two of Meador’s colleagues don waders and drag a 60-foot seine along the bottom of the bay, just offshore, pulling up an astonishing bounty of tiny fish and baby crabs. Hiding in the murk at the bottom are several Southern flounder babies, and flopping around vigorously are wee little spotted seatrout and red drum, the tiny redfish already sporting the distinctive black dot on their tails. There are dozens of juvenile pinfish, croakers and bay whiffs, too, along with the tiny crabs in pursuit of anything that moves. It’s an encouraging catch after a cold winter. Meador and her team use bay trawls, gill nets and oyster dredges to monitor the key bay species sought by anglers and commercial fishermen. Other indicators, however, have been positive. Despite all the recent stresses, including a 50-year record drought followed by the wettest summer on record and a cold snap, some fisheries are at or near record numbers, including red drum. Gill nets have brought up seven to 10 species per haul, indicating an increase in diversity in the bay. Moreover, the seatrout seem to be on an upswing. One of the difficulties for scientists, observes Meador, is that fish populations have normal up and down cycles, irrespective of extremes of weather and human intrusion, and nature can always harbor surprises, both good and bad. 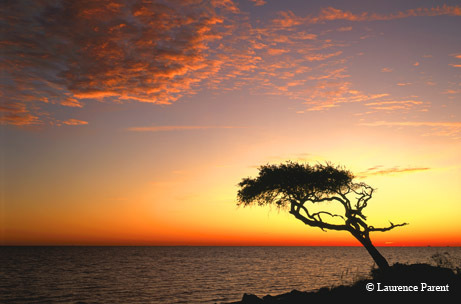 Aransas Bay is in such general good health that it was chosen as one of 28 sites in the National Estuarine Research Reserve System, known as NERRS, whose goal is to conduct long-term research in relatively natural settings. “In order to be chosen as part of the project, a site has be fairly pristine,” says Sally Morehead, manager for the Mission–Aransas Bay NERR project, which is based at the University of Texas Marine Research Institute in Port Aransas. The Mission-Aransas Bay NERR, which encompasses 185,000 acres, has remained healthy, she says, in part because the land surrounding the reserve includes undeveloped ranchland as well as land protected as part of the Aransas National Wildlife Refuge. Each NERR around the country is using standard procedures to conduct system-wide water monitoring, says research scientist Kiersten Madden. We are heading by boat to the Aransas Bay monitoring station, one of five stations located around the reserve. We arrive at a platform in the bay, where a cylindrical device suspended inside an underwater pipe is transmitting data every 15 minutes for salinity, dissolved oxygen levels and turbidity. We visit the Education Center in Rockport, where visitors can view the real-time data on weather and water quality being transmitted by the reserve monitors. The data, says Madden, is useful to commercial fishermen as well as scientists. But just as important as the real-time data are the charts from previous years that indicate the effects of drought and flood on salinity. As I peruse those charts, a group of visitors punches a button in a whooping crane exhibit across the room, launching a recording of a crane’s eerie mating call, and I feel a chill as I look at the spike in salinity from 2008 that coincided with all those crane deaths. When you can see the cause-and-effect fluctuation in water conditions so clearly, you can’t help but wonder what might happen if things got a lot worse, weather-wise, or if we take out too much water from the Guadalupe River before it gets to San Antonio Bay. Though it may seem a stretch to compare such large birds requiring so much space to caged canaries in a coal mine, there is a way in which this iconic species carries a special message about the health of our bays. Because they are the rarest of the species in that ecosystem, Liz Smith explains, they are the most vulnerable to sudden changes.